Large satchel with secure zip pocket inside. Front flap closes securely with velcro, and long strap .. This dancers are..... bag has a zipper closure and a zipper inside pocket. 8" X 13" X 7.. KIT COMPOSED OF 3 NOTEBOOKS IN 3 DIFFERENT GRAPHICS NOTEBOOKS SIZES: 1 X A5, 1 X A6, UND 1X..
100% Microfiber 25 x 33 cm .. Cute satin diamante lace backpack for the young ballerinas. ..
Dance Holdall Bag. Polyester bag with contrasting Bloch Logo print. 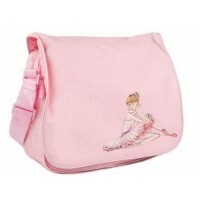 Detachable and adjustable..
BLOCH SAC DE DANSE GRAND Πλάτος 46 cm, Yψος 30 cm, Bάθος 22 cm ..
ΠΟΥΓΓΙ ΜΠΑΛΑΡΙΝΑ Handmade creations by Mandy ..
Nylon rucksack with Freed Logo ..
COTTON SHOPPER 16.5"W x 14.25" H x 4" D (41.9cm W x 36.2cm H x 10.1cm D) ..
MINI POCHETTE CASSANDRA personalised zipper Lined in light pink cotton, printed both sides Poly..
Pochette 11 x 9 x 2,5cm ..
Dance Tote Bag Dance logoed tote Comfortable shoulder strap Zip close Main: 100% Polyest.. Organizer Bag Use the portable organiser to keep your shoes and necessities tidy. One size ..
Dance Bag A lightweight and stylish studio bag that organizes and carries all of a dancer's n..
100% Nylon Drawstring top fastening Zip lock fastening at base 2 back straps .. Always Dancer Shoulder bag 32 x 40 cm 100% nylon ..
ΤΣΑΝΤΑΚΙ ΜΕ ΦΕΡΜΟΥΑΡ ΓΙΑ ΤΟ ΜΑΓΙΟ ΣΑΣ Η ΑΛΛΗ ..
BALLET BAG 28 cm length and 17 cm diameter 100% polyester ..
Shopper Bag 40 x 21 x 11 cm ..
Rucksack 30 x 33 x 15 cm ..
Design Pointe Shoes Tote Bag 23 x 28 x 13 cm ..
Duffel Bag 35,5 x 20 cm ..
Ballet bag for girls 33 x 18 x 18 cm 100% polyester .. Shoulder Bag 16,5 x 15,5 x 4,5 cm Polyester, all over print ..
Μικρή παιδική βαλίτσα trolley Lillifee. Στολισμένη με glitter! Διαστάσεις: περίπου 24 x 2..
Τσαντάκι βόλτας Ballerina Τσαντάκι ώμου της εταιρείας Okiedog. Αποτελείται από μια κύρια θήκη που..
ΣΑΚΙΔΙΟ ΚΑΠΙΤΟΝΕ RUCKSACK ΠΕΤΑΛΟΥΔΑ ..
ΤΣΑΝΤΑΚΙ ΜΟΝΟΚΕΡΟΣ Κρατήστε τον πλανήτη πράσινο, προσφέροντας ένα δωράκι μέσα σε μια τσάντα δώρου..
Só Dança Bag with design cotton/nylon 45X30X14 ..